There is a lot of information to take in when it comes to search engine optimization, and sometimes it’s good to step back and evaluate whether your company is gaining value from the monthly reports you’re given. This article focuses on four key areas where you can really dig into your Google Analytics, play around and really learn something. These SEO tips and tricks are great for business and website owners, and even for marketing managers who want more from their SEO reporting. These tips give you a chance to delve deeper into your marketing efforts and gain more insight from your analytics, without taking up an abundant amount of time. Depending on what browser (Internet Explorer, Firefox, Chrome, etc.) your viewers are using to visit your site, results can vary dramatically. Because of different browser settings, your website could be formatted differently on Internet Explorer than it is on Google Chrome. If you’re not continually testing your website formatting on different browsers, or investing in a browser testing system like BrowserStack, you may be experiencing formatting and usability errors without even knowing! Unfortunately, if the formatting of your website gets a little bit wonky, viewers may quickly click away from your site and look for greener pastures. 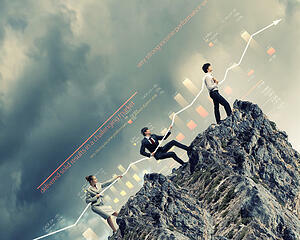 But, there is a quick and easy way to get insight by checking your Google analytics. To get to the Browser & OS data, you will want to click on Audience > Technology > Browser & OS. Once you are in the data view, you will see a list of browsers on the left, and columns separated by “Acquisition,” “Behavior” and “Conversions.” For the purpose of quality control, you will really want to delve into the “Behavior” section, which provides data for bounce rate, pages per visit, and average visit duration. Beginning with bounce rate, there are certain indicators, or red flags rather, that will hint at browser issues. If the number in that column is close to 100%, there is a chance that your site is not formatting correctly on that browser. Essentially, a bounce is a viewer that lands on your webpage, but ends up leaving without interaction. Of course, we want our viewers to interact, and ultimately become customers, so usability is very important. The average bounce rate for a content website is around 40-60%, so anything above 60% should send up red flags, especially if you’re seeing a big difference between various browsers. Now, this doesn’t necessarily mean that there’s something wrong with your site functionality on these browsers; you should also consider the other data points provided. How much traffic is coming from the browser? If it’s one or two views, it probably doesn’t mean that you need to enlist your production crew to overhaul the site. But if it’s one of your top browsers with a higher percentage of views, it may be something you want to consider looking into further. On the same note, it’s also important that you get an idea for how many of your viewers are reaching your site using a mobile device. Today, over a billion people are using the web from their mobile devices, so optimized usability and site view are crucial for a brand’s online presence. You might be surprised when you actually see the numbers. Take our own site for example. Two years ago, only about 25% of our traffic was coming from mobile or tablet devices. Now, it's nearly half and climbing each month. To not have a site that is optimized for mobile, is a wasted opportunity - you're likely missing out on valuable leads and potential customers. To find this information in Google Analytics, you will click on Audience > Mobile > Overview. Compare data similarly, as explained above. Typically, a mobile bounce rate will be 10% higher than an average bounce rate, so if you notice your mobile bounce rate above 70%, it may be something you want to take a closer look at. Check out your top 10 pages shared on social media when creating your blog editorial calendar for the month. There is a ton of information you can get from these pages! For example, compare the page titles. Do you notice a trend? Are your “how-to” pages performing better than your “5 Reasons” pages? Perhaps a certain type of post resonates better with your audience. Use this knowledge to your advantage and give your audience what they're looking for. Reflect this post type into your new calendar to mimic the positive results you’re receiving from previous top posts. Now click into the pages themselves and look at the type of information they’re displaying. Is it a blog post with a lot of written content? Is it a video or infographic? Is there a lot of user engagement in the comments? Keep this in mind when brainstorming new topic ideas. You might notice that one type of content is clicking with your audience; now you can test to see if that same type of content increases traffic and engagement. Now that you have a better idea of what types of posts resonate well with your audience, take a look at the platforms they’re using to find your content. This is found in the “Social Network” section. Here, you will get an idea of which platforms you’re doing well on, and which ones could use a little extra loving. Alternatively, this can also show you where your readers / potential customers are and where you should continue to push your efforts towards. Try to maintain the good work you’re doing on your top platform, but also try to incorporate more work into some of the mid-range platforms if appropriate for your personas. Maybe you’ll even find a new platform where you can branch out, adding to your inbound efforts! To view keyword data, click into Acquisition > Keywords > Organic. Though much of your keywords will be classified as (Not Provided) because of Google’s privacy settings, there is still information drawn from search engines other than Google that will give you some really good detail. Once you’ve found your keyword list, take it a step further and add a secondary dimension to get more information. 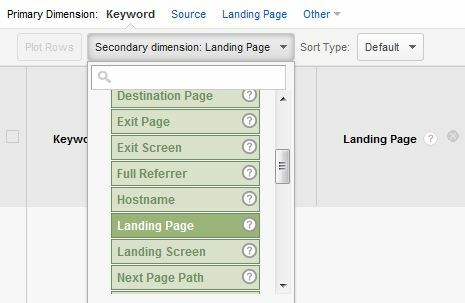 In the “Secondary Dimension” dropdown, scroll to “Behavior” and then choose “Landing Page.” This will show which site page drew a visit from the keyword in particular. Knowing this, take a second look at the list of terms and become familiar with the tone and phrasing of search queries. As you continue to build out content, be mindful of how you’re constructing your pages. Are you truly answering the questions that are being asked? Are you avoiding jargon, and instead, using the terms that your viewership is familiar with? Are your targeted terms long-tail enough to match up with actual search queries that your personas are using? Always keep these questions in mind as you’re planning out campaigns. Use the information at your fingertips to drive more research, and return more personalized results. Find the behavior flow chart by clicking Behavior > Behavior Flow. Ok, I know, the behavior map can look a little intimidating, but once you get over the initial, “waaaaah?” there is so much to learn! One way I really like to use the behavior map is to compare the behavior of different users. For example, you can compare the behavior of all visits to that of someone who is coming from social media. 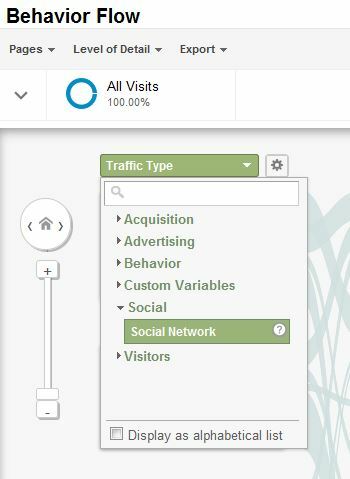 Or, you can choose to view by traffic type and follow the paths that each of the different medium follow. To organize the map view, you can select different variables from the dropdown box. In the example to the right, I’ve selected social networks. Additionally, if you click on the white boxes, there is an option to “highlight traffic through here,” which I find to be helpful. Now what does this show me? For one, it may give me a better idea of why someone is using my site. Looking at New Breed’s traffic from social media, I can see that much of the traffic goes directly to individual blog posts; much more so than from our average traffic. It makes sense that social media viewers are sharing detailed posts because these are more entertaining and social friendly. Knowing this, we can be a lot more intentional about which pages we include in our social shares. On the other hand, our direct traffic has a more direct path to our premium content offers and products page. If we weren’t seeing that path, we might consider ways in which we could better direct viewers to our services. Ultimately, we’re looking for customers, so looking at the behavior flow can help you determine where these qualified leads are coming from. From there, you can more consciously separate the ways you direct marketing towards different medium. Google Analytics is a hugely vast tool, and very valuable to add to the repertoire of marketing tools you use on a daily or weekly basis. So much beneficial information can be gained, but sometimes it can be a little overwhelming. Hopefully, some of our tips above will help you gain knowledge and/or inspiration to dig a little deeper into your company’s inbound efforts and analyze performance levels.